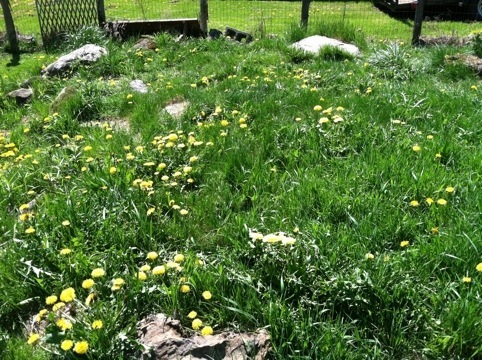 A burgeoning dandelion wine farm you ask? Oh no. That is our backyard. And every year I look onto this grassy wasteland of rocks and weeds hoping for inspiration. Every year I seek inspiration from the usual places; Martha, Country Living, Gardener’s Supply, etc. This year, we get serious. Stay Tuned: From Wasteland to Secret Garden in 2012. This book is a must have desk reference for anyone who wants to start a backyard homestead or begin to dabble in producing their own food from scratch. Upon purchasing this book I had some AHA moments about being a bonified urban homesteader. I have not mastered anything mind you (as clearly illustrated by this year’s less than bumper crop of carrots and beets), but I do feel that I have a good handle on growing vegetables in a garden. So 2012 our goal is to make our yard a well-rounded food bearing garden retreat. We would like to add apple trees and perhaps some pear trees. We would like to clear out the random and useless rock garden next to our pool and create a blueberry patch. We would like to plot out a location for raised strawberry and raspberry beds. Perhaps a deck and real live fireplace and/or bread oven. Perhaps a door yard full of berries and nuts. Boxed herbs and of course a handful of containers loaded with tomatoes, peppers and cucumbers. Oh and maybe, just maybe we might actually get that compost system set up that we have been threatening to put into operation for 3 years now. 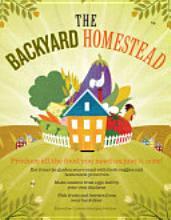 So, you ask what will these homesteaders do for fresh and local produce next year? 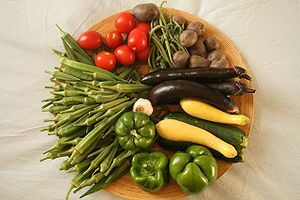 Well, we will start by getting a full share in our CSA, Maplewood Organics. My final calculation after this last pick up of what we received for this season was nearly $350 of organic potatoes, peppers, onions (which, I might add, organic onions were going for $2 a lb. today at the grocery store) brussel sprouts, broccoli, tomatoes, fresh-cut flours, swiss chard, kale, radishes, lettuce, green beans and more. Given that, I am super excited to see what a full share will garner us. Of course there is always our local farmers markets and farm stands where buying in bulk is encouraged. Having just filled my belly with Gluten Free Lasagna made with delicious homemade tomato sauce, we will make sure to do whatever it takes to get our hands on fresh tomatoes. So. long story not so short, we will do what our ancestors have always done and give our garden plot a rest after what can only be described as a “challenging” season for growers across the nation. We will fill it with winter rye, and host a potato sack race over the top of it for leap year in July!!! 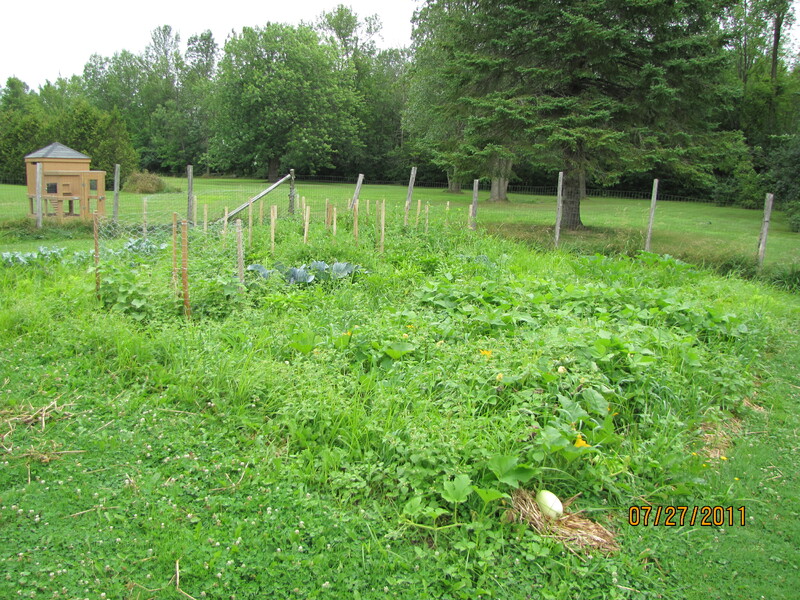 We will build the backyard homestead/haven of our dream and in 2013 recreate the veggie magic of old. And by then, ideally, I will be picking my first apples from our own tree, making my own soap, jewelry and clothes (try to contain your envy) and munching on homemade yogurt and string cheese. At the end of the day, homesteading is an attitude and a lifestyle. Gardening is a huge part of that, but anyone can grow a vegetable, a true homesteader grows and decorates an entire buffet. Fall Sunday’s are the best!! Breakfast is always delicious, especially when you are never really in danger of running out of fresh and delicious backyard eggs. Baking becomes one of my favorite hobbies and today gfree cupcakes fill the house with warmth while weight watchers approved end of garden veggie soup simmers and football graces our tv!! There will be coupon clipping with hot tea and much to my joy, Price Chopper is allowing digital coupons to be uploaded to their advantage card. It is an autumn miracle!! 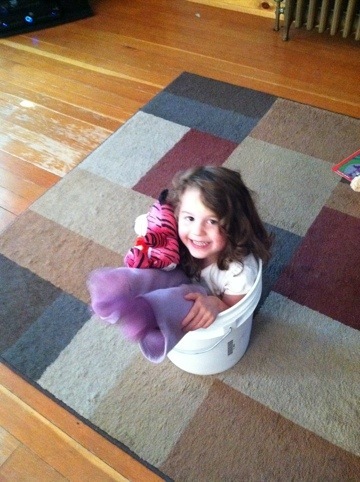 And of course if no day is complete until you put your kid in a bucket!! My family has just returned from an amazing 4 day excursion to the Adirondack Mountains in New York. We were totally off the grid and it was amazing and relaxing. If the dream of owning an organic farm falls through, you may find us running an inn/b & b in the mountains, but that is a tale for a different day. As it turns out, however, the garden did not tend itself while we were away. Naturally, the days preceding our departure were some of the hottest on record so to even pick a cucumber off the trellis was exhausting, therefore weeding more or less, or really just more, did not occur. And there it is, the dirty word amongst all organic gardeners: WEEDING. As much as you mulch and till and try to ban non edible seeds from the garden plot, there is just no way around it, you will weed or you will drown your garden in pesticides. I will take the weeds. 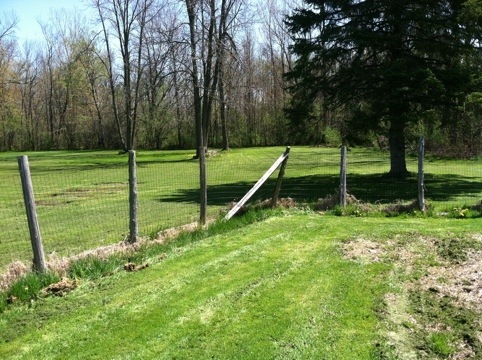 In fact, I find weeding to be fairly cathartic. Nothing works out the stresses of a bad, bad day like ripping an invasive garden invader out by its roots and throwing it to the side of the garden. Weeding also provides you with a sense of accomplishment on a day like today where my only goal was to have a goal. Finally, it helps you to have a connection to your food, which is the primary reason I got into gardening. So today, as I approached what was my garden 4 days ago, I felt like a conquistador of old approaching the jungles of the New World, minus the machete. In truth, a machete would have been super helpful, but I simply did not have one on me. So I spent the better part of this vacation day plucking weeds and uncovering a trove of garden treasures that were not there when we left. 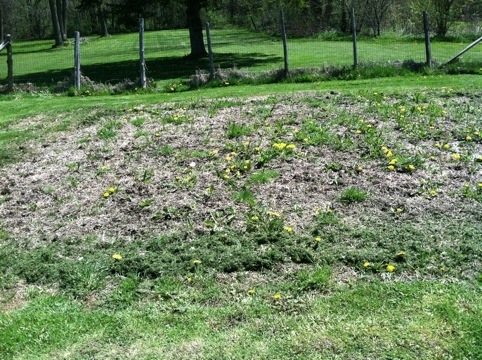 It was hard, hot work and it often seemed that the weeds would regrow immediately after I pulled them out. Despite being neglected for 4 days and becoming an Amazonian forest, the garden exploded with healthy, happy and some ripe tomatoes. Spaghetti squash was everywhere to be found. Full size cucumbers that will become delicious refrigerator pickles tomorrow. 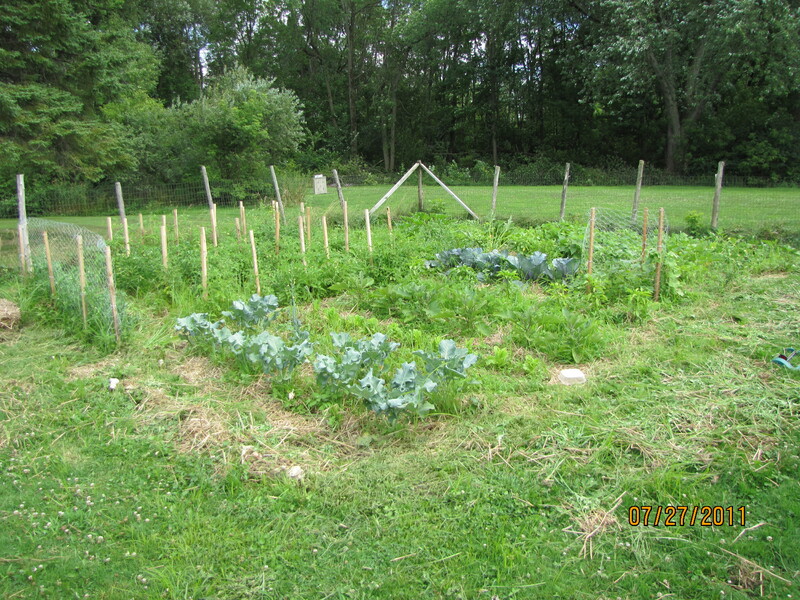 Herbs, peppers, lettuce and cabbage all thrived underneath the overgrowth. Despite being attacked by Japanese beetles and being surrounded by weeds, the green beans were beginning to pop. Peas, kale and swiss chard were almost overwhelming with their presence. Our sugar snap peas, after an alarmingly slow beginning, seemed to appear out of nowhere. At times, pulling out the weeds was like uncovering a secret treasure trove of plentiful veggies. In the end, the garden looked like a garden and my kitchen was full of fresh veggies to eat, freeze and pickle. So while I might be more likely to get back on an every other day weeding plan, it was reassuring to know that while the gardener was away the veggies would still play AND more importantly, that if you don’t get to that weeding every day your garden will not fall over and die. The Veggies are Coming! The Veggies are Coming! Here in Vermont, in case you haven’t heard, we had what some folks, biblical or otherwise, might refer to as a FLOOD. While most people were drawing up architectural plans for an arc, our family was figuring out how we might push a roto-tiller through a swamp or wondering if the chicken coop would float with a dog, cat, toddler and two adults on top. In the end, the water did recede, but alas, took all of our soil’s nutrients with it. As a family, we are currently in the process of turning chicken poop into black gold. If that sentence makes no sense to you visit this article to learn more, but in the meantime, our gold has not yet come in and our garden went into spring nutrient free (at some point I will give you more information on all the ways chickens rock, right down to their pooh, but that is for a different night). This year we planted with high hopes and short seedlings. It is mid-July and we still have short seedlings. The good news, with some love and Epsom salt we are starting to see our plants spring to life. The tomatoes and peppers are booming with fruit. The broccoli plants look good, they just need broccoli. The cucumbers are coming and by the weekend we may have our first batch of sweet relish. I can’t really talk about lettuce, because this year the lettuce not only adapted but spread. If only the rest of the salad would arrive, then we would be in business. Tonight, however, my hope was renewed when I pulled the seasons first zucchini out of the garden. Sautéed in butter with caramelized onions it was the perfect addition to the chili rubbed pork chops that were flaming up on the grill. If you have ONLY ever eaten zucchini from the store, you have no idea what you are missing. The flavor and texture were like fireworks in our mouths. So in short, if you have a garden, do not let this late season get you down, the veggies are coming. Perhaps some more than others, but they are coming nonetheless. If you don’t have a garden, late or otherwise, than get to your local farmer’s market this weekend and get some fresh zucchini of your own, because it was well worth the wait!! !